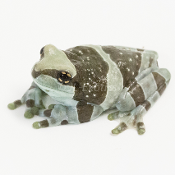 The Milk Tree Frog is another large mellow frog with a ferocious feeding response and a stunning appearance. As juveniles they look like little panda bears! Often times the amount of white will be partially replaced with light brown or gray as they mature, but some animals retain much more white than others. Incredible climbers, they easily climb glass, wood, rock, and everything in between. This comes in handy for them in the wild as they are typical canopy dwellers in the jungle. In nature, they will spawn in hollow tree trunks instead of coming to the water's edge like many of the other tree frogs. Found in Bolivia, Brazil, Colombia, Ecuador, French Guiana, Peru, Suriname, Venezuela, the animals available originate from Brazilian stock. Female Milk Frogs can reach ~ 3.5" in length and the males are typically smaller in the 3" range.